Venusina sopka je 643m vysoka vyhasla ctvrtohorni sopka nad obci Mezina, jizne od Bruntalu. Na vrcholu je plochy krater a bocni kratery s lavovymi jeskynemi. Sopecnou cinnost zde pripomina pouze cervenohnede zbarveni pudy a na severovychodnim upati dva lavove proudy. Geologicky se sopka radi mezi tzv. stratovulkany a je tvorena vylevnymi horninami (z nichz ma nejvetsi zastoupeni cedic), ktere jsou pokryty sopecnymi vyvrzeninami charakteru tufu a tufitu s vyskyty tzv. „sopecnych pum“. Venusina sopka je znama i mineralogicky, nebot se v cedici hojne nachazi zeleny nerost olivin. Na Venusine sopce muzeme pozorovat cervene tufy, ktere se v minulosti se tezily jako stavebni kamen a tim na vrcholu vznikla prohluben, ktera mylne pripomina nekterym navstevnikum krater. Venusina sopka vsak nabizi jeste jednu prirodni zajimavost! Je ovsem treba vratit se az k severovychodnimu upati, kde se nachazi opusteny lom. Pri vstupu se pred nami se objevi vysoka skalni stena, tvorena radou svislych cedicovych sloupu (zname take jako kamenne varhany).Zdejsi cedicove sloupy vznikly ochlazenim lavoveho proudu, ktery vytekal ze zhaveho jicnu Venusiny sopky. Vsechny prilozene fotky musi byt porizeny na Venusine sopce nebo u lavoveho proudu Venusiny sopky!! The Venus volcano is 643m high extinct quaternary volcano near by Mezina, southwards by Bruntal town. 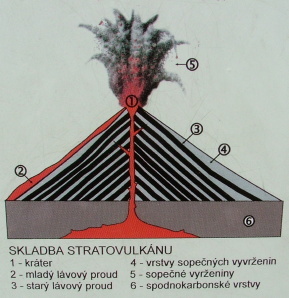 On the top of this volcano you can see equal crater and side crater's with lava cavern's. Suggestve of volcano activity if only red-braun coloring soil and on the northeast root of volcano you can see couple of lava flow. Geologically is this volcano fall into the stratovolcano group. Venus volcano is form of bailing rock (one of most frequent is Basalt), that are covered with volcanic ash ejected Tuff and Trass character. 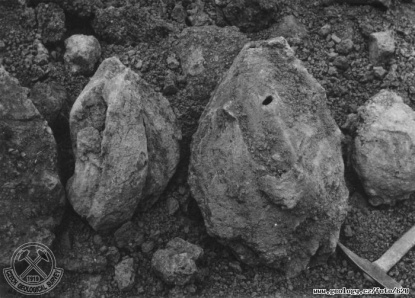 You can find here o lot of volcanic bomb and the Venus volcano is known for her mineral, because in her Basalt abound green mineral olivine. On the Venus volcano you can see red Tuff, which is in former times extracted as building stone. 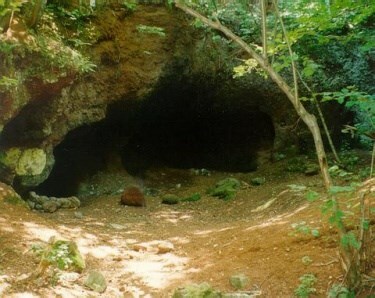 This activity created cavern on the top and now mistakenly suggestive volcano crater for many visitors. Venus volcano offers yet another natural interest! You need come back to the northeast root of volcano where is abandoned basalt quarry. Near by entrance to quarry you can see high rock wall, which is form from tier of vertical basalt columns (that you know as a columnar basalt). 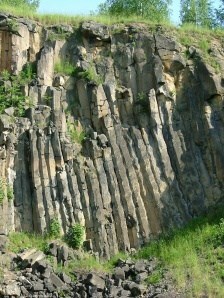 This columnar basalt originated from cold snap lava flow, which flowed out from a hot crater of Venus volcano. All photos must be created on The Venus volcano or near by Venus volcano lava flow quarry!! 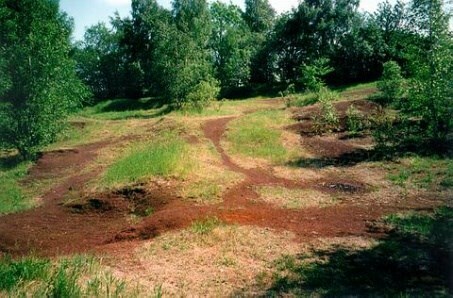 1) Photo yourselves (or GPS) with lava flow - quarry (photo apply to log - waypoint coordinates). 2) Photo yourselves (or GPS) with volcano bomb (photo apply to log - near by waypoint coordinates). 2) Measure ASML altitude (possibly with the aid of his GPS) height of Venus volcano (base coordinates). 3) Send me e-mail with measured altitude and explain how originate volcano bomb.